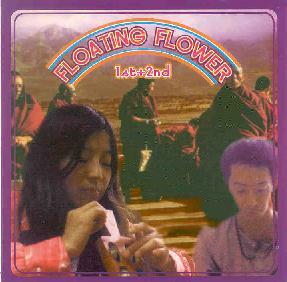 Floating Flower - "1st + 2nd"
Here's a fine package containing two albums recorded for Acid Mothers Temple's own label in '98 and '99 respectively, now re-issued as a limited edition 500-run CD. In the liner notes, Acid Mother's Kawabata Makoto says that his two cohorts (Yuki on vocals/violin/sitar and Keneko Tetsuya on tabla/electric-guitar) are off travelling in India whenever they have the chance, while of course Kawabata himself stays busy with AMT and other side projects, so a reunion may be unlikely. But still, they've left us 75 minutes worth of classic acid-raga jams of pure psychedelia to feast on, some of the best you're likely to hear anywhere. The entire CD offers little variation in terms of style and pace, the latter of which can make it a bit difficult to take in in one sitting, but one sitting isn't necessary... and it all depends on the listener's frame-of-mind (ahem!) anyway. Kawabata actually attributes most of the accolades to Yuki and Tetsuya, who form the more organic, improvised aspects of the music, while his own main contribution is the rhythm of his patented dreary rainy-day Brit-folk acoustic guitar, as well as electric-guitar on a couple tunes (though his production is obviously integral too). Added to that, wandering psychedelic monks Yuki and Kaneko incessantly improvise by way of her violin and space-wails and his tabla and guitar. Speaking of guitar, whether by Kaneko or Kawabata, the electric stuff is exquisitely lilting ether-travelling wails, comparable to the Spacious Mind. Yuki's vocal-as-instrument appears on all tracks, is present most of the time, and while a bit overused and monotonous, there are moments when she lifts the pitch and intensity level. Occasionally this trio reaches peaks of improvised psychedelic fluidity comparable to Hawkwind's "You Know You're Only Dreaming" or Amon Düül II's "Wie der Wind am Ende einer Strasse". "Johsho Kiryu" and "Wave Ring" are a couple great tunes which, among others, seem to feature what I was sure were synth or tronics, but if not, as the liners indicate, it's some of the best pedal-proccessed guitar-tricks I've ever heard. The former adds tuneful and timely sitar, while the latter's stubbornly simple tabla/acoustic-guit rhythm draws you in before the aforementioned synth-wobbles are introduced to intensify the mood as things gradually speed up. "Fuwa Fuwa" is a colossal jam of 14 minutes, starting off with acoustic strumming like Zeppelin's "Gallows Pole", before heading off into the wandering minds and fingers of the three, a trance-inducing tabla-driven foray, which progresses very subtley, Yuki's vocal getting pretty intense at one point, the violin and guitar sounding as delicate and harmonious as ever. "Walk in the Air" is another lovely piece, accentuated by a delicious embellishment sounding more like flute or clarinet. And so on... the music seems to get better as the disc progresses. "Desert" has another Zeppelin 3-ish folk theme to it, again courtesy of Kawabata. Indeed, if there was ever an album to make you run for the dope, incense and colored lights, this is it. All I could do was scrape my pipe, but fortunately I still felt quite satisfied by the aural trip. This review was supposed to appear in July's edition of A-I, so I hope there are still some copies left. If not, maybe that's a good thing, as a second pressing would be in order. Though only several years old, probably the original vinyls are nearly as obscure and coveted as a lot of albums from psychedelia's golden age. For more information you can email Black Plastic Sound at: blackplasticsound@yahoo.com. 1st + 2nd is distributed by Summersteps Records. You can visit their web site at: http://www.geocities.com/summersteps/.